Shawn Kane fires a shot. The following RHS hockey players have achieved 100 point totals in their high school hockey careers. 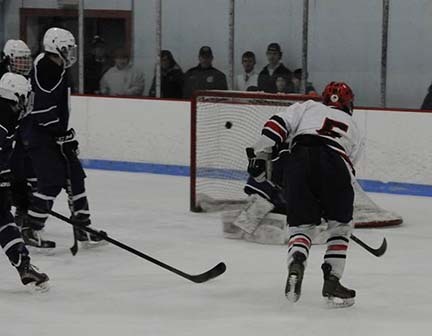 On January 15 against Norwell High School, Shawn Kane, a Rockland High School senior, achieved a prestigious milestone when he earned the 100th point in his high school career. In ice hockey a point is earned when you either score a goal or pass the puck to someone who scores a goal. Kane has been working with Coach Flaherty since he was in eighth grade on the varsity hockey team. Some may think that it would be hard to get a team back on track after such a momentous occasion but senior captain Andy Reardon says otherwise. The last two players to earn this did it two years ago and that tells you that it isn’t a common occurrence. Kane had confidence in his athletic abilities saying he knew that it was going to happen all along.